This was an awesome event. I was glad I could bring my family with me. We can handle groups from 20 - 350! 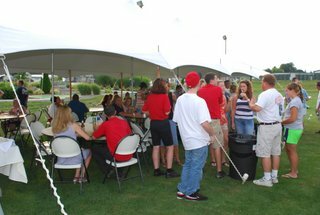 Build camaraderie with friendly competition, show off your putting skills on the mini golf course, or hit a home run in the batting cages. Practice up on the driving range or soak your supervisor with a friendly game of Water Wars, or cool off by enjoying one of our custom flavored ice cream cones. Both the food and venue were great for a family picnic. The kids had a blast and commented how this venue was better than where we used to go. The Center offers a beautiful facility for your Corporate Meeting. Location was close to home. The kids loved the activities available. This is a great spot - close and a lot of fun. I liked this venue - plenty of shade, grass, fun activities for all ages. Private corporate event parties can be arranged for groups of 50 - 350 with on-site catering. Call us today as we as the calendar fills up early.